Like a bar that’s only open weekday mornings, wind subsidies only give us what we want when we need it least. Most people understand the basic limitation of wind power: you only get electricity when the wind is blowing. Any first-time kite-flier can attest to the fact that wind speed is highly variable. Because there is no cheap way to store energy for later usage, wind variability is one of the biggest reasons wind power is not more widely-embraced as an effective method of electricity generation. Realizing that wind power can never provide a long-term renewable energy solution on its own, proponents of wind subsidies such as the Production Tax Credit (PTC) argue that wind power can play a useful role by providing important additional capacity. However, a new study from Dr. Jonathan Lesser, a thirty-year veteran in the energy industry, disproves even that paltry justification for wind subsidies. Dr. Lesser’s study found that, over the course of several twenty-four periods from the past summer, wind electricity generation fell to its lowest level precisely when the power grid might actually benefit from additional generation — in the middle of the day when people are using the most electricity. Conversely, wind electricity generation reached its maximum output at night, when demand for electricity is low. Figure 3 from Dr. Lesser’s study depicts this phenomenon in the PJM region, an area that includes the mid-Atlantic states and the Ohio Valley. 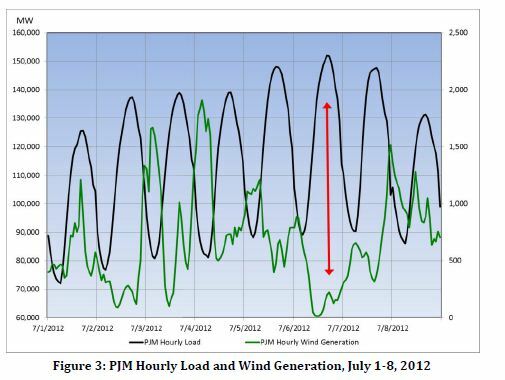 The black line depicts the total electricity load, or demand, and the green depicts the wind production. It should be noted that the scale for the electricity load and wind generation is different—wind does not come close to meeting the electricity demand in the PJM region. Dr. Lesser also studied wind electricity generation by season and found that wind generation was dramatically lower in the summer months. Summer is typically when power plants typically have to produce at full capacity to meet the demands of air conditioners and other cooling appliances. An illustrative example of this phenomenon came in July 2012 when, during a heat wave in Illinois, wind generated less than 5% of its capacity. On one day of the heat wave, demand for electricity in northern Illinois and Chicago averaged 22,000 MW and the average wind power generation was an anemic 4 MW out of more than 2,700 MW installed wind power capacity. Figure 7 from Dr. Lesser’s study shows the “load-wind ‘gap’”, meaning the difference between relative wind generation in a given season and relative total electrical load in that season. A positive gap means there is relatively more wind generation available compared to total load; a negative gap means there is less available. As the figure indicates, wind availability is much less in the summer, when the need for electricity is highest. This finding comports with common experience: hot summer days typically aren’t very breezy. Yes, but doesn’t the wind PTC lower electricity prices? 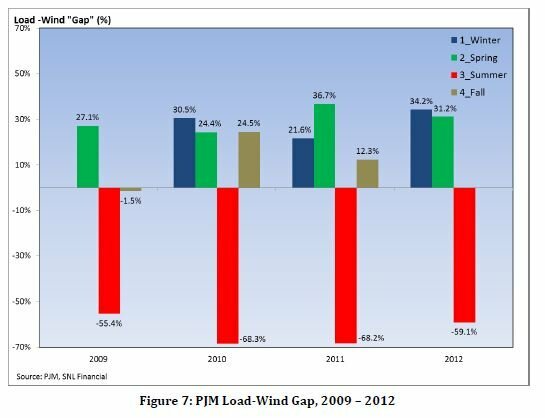 While Dr. Lesser’s data strongly suggests that wind is not a useful way to augment a grid’s electrical capacity, pro-wind groups can still argue that, while wind is not the best way to add capacity, surely it does not hurt to have even the marginal contribution from wind whenever it is available. Some pro-wind writers have noted that the additional capacity from subsidized wind electricity generation might artificially suppress market electricity prices. However, as Dr. Lesser points out, there are several subtler costs in addition to the obvious burden of paying for a wind subsidy. To the extent that additional subsidized wind capacity can reduce electricity costs to consumers in the short run, the PTC hurts electricity consumers in the long run. The PTC harms unsubsidized electricity producers by making wind generation artificially competitive with nuclear, coal, natural gas and other source of electricity generation that do not receive subsidies as generous as the PTC. This results in early retirements and a lack of investment in reliable sources of electricity such as nuclear, coal, and natural gas. After the retirements, more expensive sources of generation will be used when the wind is not blowing, leading to increased electricity rates. In addition, since those marginal unsubsidized electricity producers are more reliable than subsidized wind power, the resulting electrical grid will be less reliable. Finally, adapting the current grid to the variability and unpredictability of wind power imposes unique costs of its own. Dr. Lesser notes that efforts to reduce the uncertainty of wind electricity generation through forecasting wind availability on particular days have proven unsuccessful. These added costs and the inherent unreliability of wind electricity generation documented by Dr. Lesser demonstrate that the PTC is harmful subsidy. Even if one were in favor of subsidizing energy sources, wind is a particularly inefficient way of achieving any economic goals relating to electricity generation.